Aimed at 'new readers', this is a retelling of the story of the little Dutch boy who put his finger in the dyke to prevent his village from being swept away by the rising tide during a storm. Standing on the dyke as a storm brews, Peter's father tells his son that old folk from the village think of the sea as an angry waterwolf wanting to reclaim the land back. The image of such a wolf in each stormy half-page scene is conveyed by Beck in his inimitable style. This would make an excellent picture book, with full-page colour illustrations depicting the dramatic events so richly described in Goodhart's text. 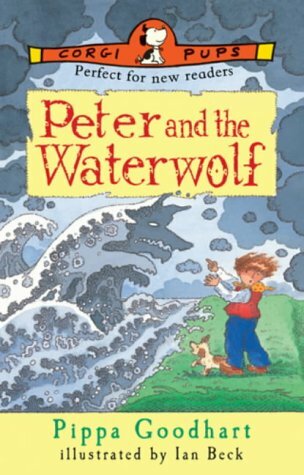 Peter's tension is vividly expressed: 'He imagined the Waterwolf, foaming and gathering, waiting to come rumbling, tumbling through the dyke to swallow him, and wallow him in waves.' Excellent.